Food: If you have food you’re pop­u­lar. Ask the cafe if they will sell you food to feed the dogs. Some, how­ev­er, don’t allow it. Doesn’t hurt to ask. Hours: Call ahead or check on their Face­book page to ensure the pet cafe you are try­ing to vis­it is open. Their hours vary and some days they might be closed. It seems their respec­tive Face­book pages are up to date. When to go: Dur­ing the week in the day­time is prob­a­bly the best time to vis­it if you’re hop­ing for few­er peo­ple. On the week­end and dur­ing pub­lic hol­i­days the cafes are busier but still fun to vis­it. Hygiene: Every cafe will require you to ster­il­ize your hands with an alco­hol spray when you first arrive. You’ll also need to remove your shoes and use the slip­pers pro­vid­ed. Some­times the cats or dogs like to pee to mark their new ter­ri­to­ry (your stuff!) so be care­ful where you put your things. I had a cat pee on my motor­cy­cle jack­et (do you know how pun­gent cat urine is?!) and a dog tried to pee on my back­pack. Drinks: All of the cafes will require you to buy drinks. The prices are about aver­age for cof­fee and oth­er drinks (by Saigon stan­dards). 30k — 60k ($1.50 — $3). A bunch of fluffy & friend­ly dogs on the first floor with a pug that will be in your lap with­in 30 sec­onds if he sees you sit­ting on the floor. Cats on the sec­ond-floor loft includ­ing a Sph­ynx cat that was quite friend­ly and want­ed to sit in my lap, maybe because we both have no hair we instant­ly bond­ed. There were also two kit­tens that looked to me like lit­tle Ewoks. 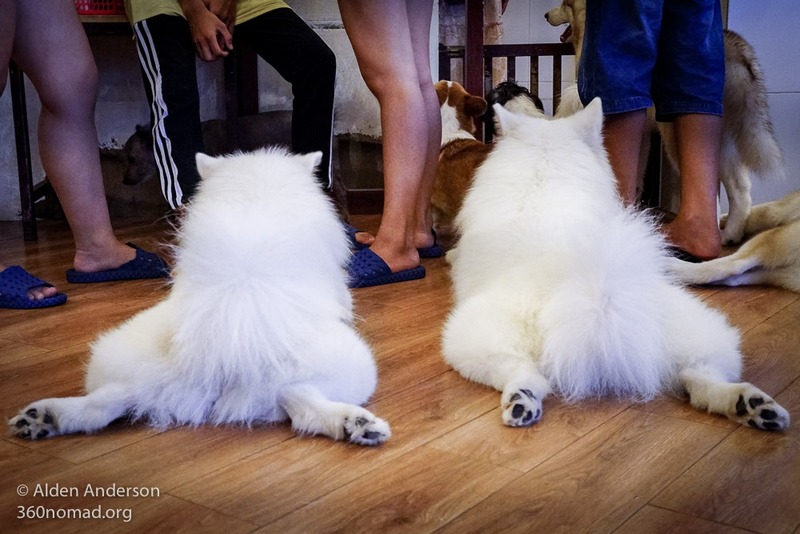 This was the first dog cafe in Saigon that I vis­it­ed. It’s well worth a stop. 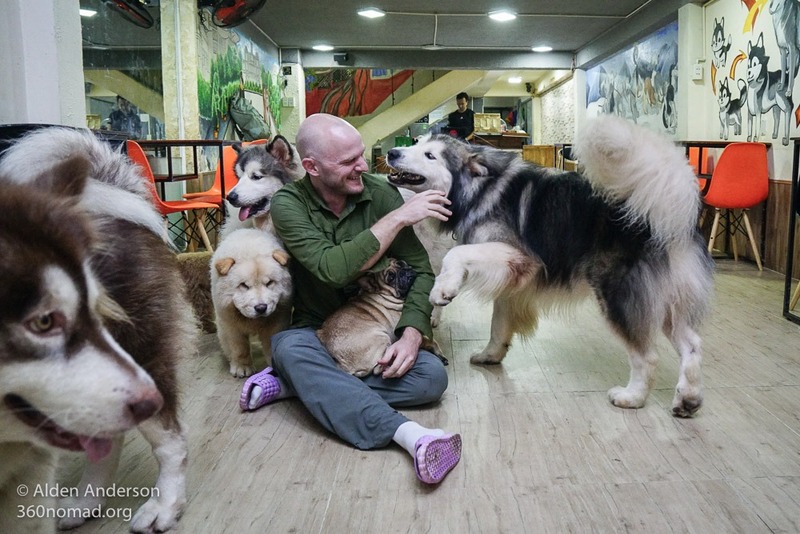 Kens’ House Cof­fee has about 12 sled dogs of var­i­ous breeds: Husky’s, Mala­mutes etc. on the sec­ond floor. There was a small very friend­ly toy dog on the first floor that greet­ed me when I walked in though I’m not sure if he’s always there. They also sell dogs on the first floor. I asked to play with one of these dogs as they prob­a­bly don’t get much atten­tion. He was so hap­py to be out of his cage for a while. One of the guys gave me food to feed the dogs. This made me a lit­tle more pop­u­lar but not quite as much as I was at the cat cafes with food where they climb all over you. They were blast­ing loud music which made it hard to talk. I’m not sure if this is a com­mon thing but you can prob­a­bly ask them to turn it down. Or maybe it’s just me get­ting old and not want­i­ng to feel like I’m inside a club with 12 dogs (That’s an idea. “Dog Club” spin­ning the lat­est EDM with roam­ing Huskies). I guess if they were blast­ing “Who let the dogs out” it might be more fun. 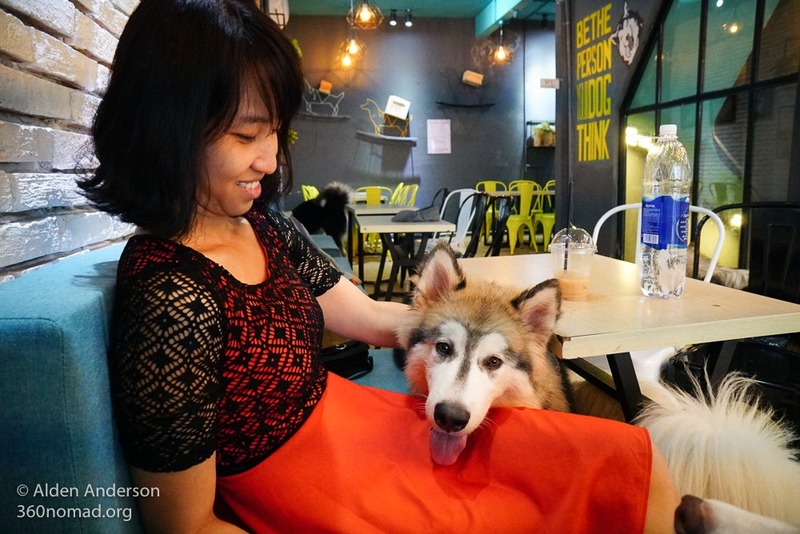 There are 2 Hachiko dog cafes in Saigon. I went to the one at 1531A Đường 3/2. 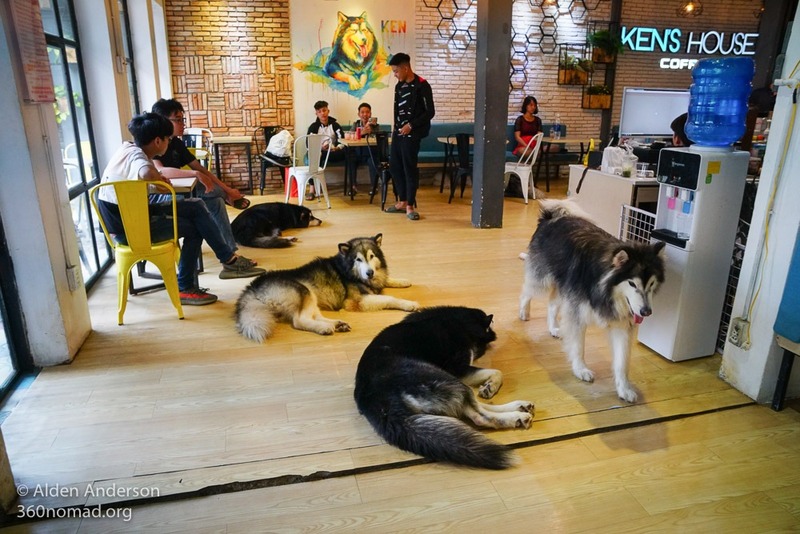 Out of all the dog cafes, I vis­it­ed they def­i­nite­ly have the most vari­ety of dogs, big and small. The cafe was full of peo­ple when I went. Dogs are very friend­ly. Though they did seem thirsty, lick­ing the con­den­sa­tion on the cups. If you notice any­thing that needs cor­rec­tion (such as very thirsty dogs) please let the staff know and I’m sure that they will take care of it. Named after the famous Japan­ese Aki­ta dog “Hachiko”, known for wait­ing for his mas­ter at the train sta­tion every day for over nine years after he passed away. Pret­ty sweet sto­ry. Read about the famous Hachiko here. A dog cafe I didn’t get a chance to vis­it. The oth­er dog cafe I didn’t get a chance to vis­it. 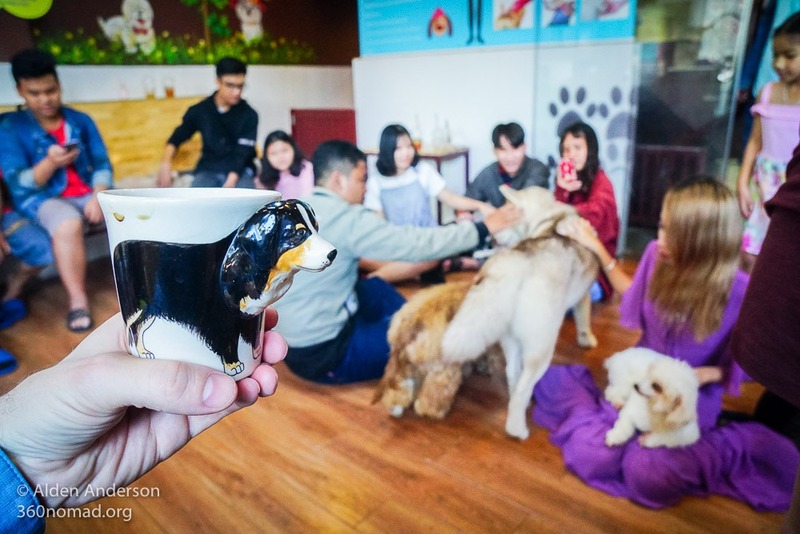 For the full list of the Pet Cafes of Saigon check out the arti­cle here! Have you vis­it­ed any of the cafes on this list? What was your expe­ri­ence? Com­ment below. I’d love to hear from you!